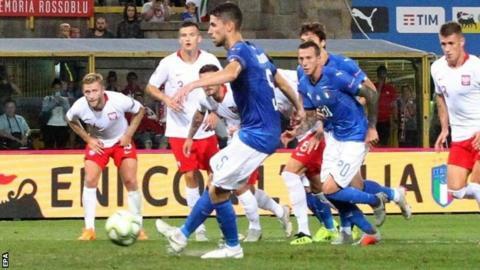 Jorginho's penalty rescued a Nations League point for Italy against Poland in Roberto Mancini's first competitive game in charge. The Chelsea midfielder's error had earlier allowed Robert Lewandowski to deliver the cross from which Piotr Zielinski volleyed the Poles ahead. But the hosts were given a way back when Jakub Blaszczykowski fouled substitute Federico Chiesa and Jorginho sent Lukasz Fabianski the wrong way. Italy visit Portugal on Monday. The Azzurri, Poland and Euro 2016 winners Portugal are in League A's Group 3 in the inaugural Nations League - with every team playing each other home and away between now and November. The winners of that group go into next June's play-off to decide the tournament winner. The Nations League also offers teams a chance to reach Euro 2020 if they fail in qualifying next year. Italy - who failed to qualify for this summer's World Cup - have won one of their past eight games, a 2-1 win over Saudi Arabia in Mancini's first game in charge. Mario Balotelli made his first competitive appearance since the 2014 World Cup for Italy - led by his former Inter Milan and Manchester City manager - but he had a quiet game in Bologna and was replaced in the second half. Match ends, Italy 1, Poland 1. Second Half ends, Italy 1, Poland 1. Attempt blocked. Federico Chiesa (Italy) right footed shot from outside the box is blocked. Assisted by Federico Bernardeschi. Lukasz Fabianski (Poland) is shown the yellow card. Attempt saved. Robert Lewandowski (Poland) right footed shot from outside the box is saved in the centre of the goal. Assisted by Karol Linetty with a headed pass. Corner, Poland. Conceded by Cristiano Biraghi. Corner, Poland. Conceded by Jorginho. Attempt blocked. Damian Szymanski (Poland) right footed shot from outside the box is blocked. Assisted by Rafal Pietrzak. Substitution, Poland. Rafal Pietrzak replaces Jakub Blaszczykowski. Foul by Damian Szymanski (Poland). Goal! Italy 1, Poland 1. Jorginho (Italy) converts the penalty with a right footed shot to the bottom left corner. Penalty Italy. Federico Chiesa draws a foul in the penalty area. Penalty conceded by Jakub Blaszczykowski (Poland) after a foul in the penalty area. Attempt saved. Federico Chiesa (Italy) right footed shot from outside the box is saved in the bottom left corner. Assisted by Jorginho. Substitution, Italy. Federico Chiesa replaces Lorenzo Insigne. Attempt missed. Giacomo Bonaventura (Italy) right footed shot from outside the box is high and wide to the right. Assisted by Lorenzo Insigne. Offside, Italy. Roberto Gagliardini tries a through ball, but Giacomo Bonaventura is caught offside. Corner, Italy. Conceded by Bartosz Bereszynski. Offside, Italy. Cristiano Biraghi tries a through ball, but Lorenzo Insigne is caught offside. Substitution, Poland. Karol Linetty replaces Piotr Zielinski. Foul by Cristiano Biraghi (Italy). Corner, Poland. Conceded by Giacomo Bonaventura. Hand ball by Damian Szymanski (Poland). Giacomo Bonaventura (Italy) wins a free kick in the defensive half. Substitution, Italy. Andrea Belotti replaces Mario Balotelli because of an injury. Corner, Italy. Conceded by Grzegorz Krychowiak. Attempt missed. Piotr Zielinski (Poland) left footed shot from outside the box is high and wide to the left. Assisted by Rafal Kurzawa. Substitution, Poland. Damian Szymanski replaces Mateusz Klich. Offside, Poland. Arkadiusz Reca tries a through ball, but Jakub Blaszczykowski is caught offside. Attempt missed. Federico Bernardeschi (Italy) left footed shot from outside the box is close, but misses to the left. Assisted by Lorenzo Insigne. Corner, Italy. Conceded by Kamil Glik.